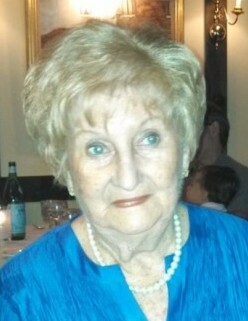 Obituary for Catherine (Bilak) Perri | Bayonne Memorial Home, Inc.
Catherine Perri (nee: Bilak), 95, of West Palm Beach, FL, passed away peacefully on Saturday, March 16, 2019 at her daughter’s Palm Beach residence. She was born in Bayonne to the late Dora (nee: Siemkiw) and Yakim Bilak and was a long time Hoboken resident, prior to retiring to Florida. She helped her late husband, Nicholas Perri, operate and manage their construction business, Unique Developers, Union City. Mrs. Perri proudly served the nation as a “Rosie the Riveter” during the World War II home front efforts. Mrs. Perri was predeceased by her beloved late husband, Nicholas Perri; amd her dear siblings, John Bilak, Margaret Smosna, Ann Colangelo, Josephine Frangione, and Jean Goldstein. She is survived by her loving daughter, Doreen Gynn, and her husband, Edward; her cherished grandchildren, Kenneth Lee Birchby III, and his wife, Jennifer, and Keith Edward Birchby and his wife, Donna; her adoring great grandchildren, Brian Gaschke, Nicholas Birchby and Matthew Birchby; and many loving nieces and nephews. The funeral will be conducted by Bayonne Memorial Home, Inc. on Thursday, March 21, 2019. A funeral Liturgy will be held at Assumption of the Blessed Virgin Mary Ukrainian Catholic Church at 10:30 a.m. followed by interment at Holy Cross Cemetery, North Arlington. Visitation will take place on Thursday morning from 9:00 a.m. to 10:00 a.m.